The weather turned out exactly as forecast, and the wind picked up considerably in the night, with occasional showers. 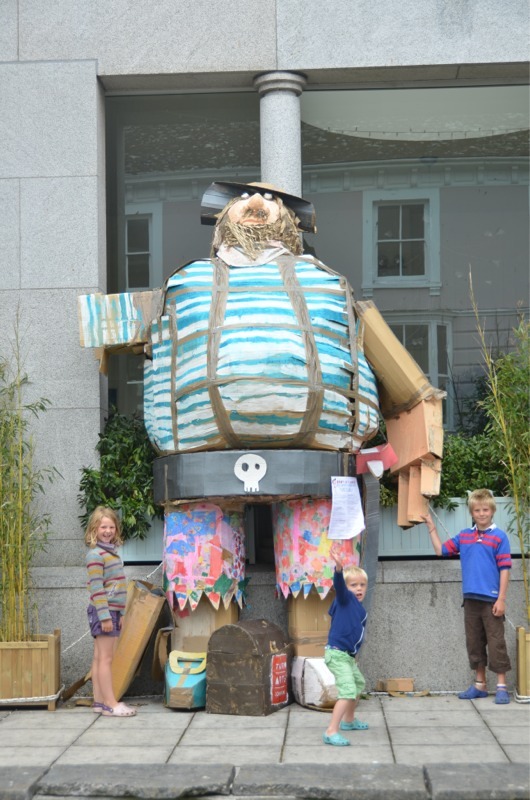 We had planned to follow the morning tide up the Fal river to Truro and had arranged to pick up Ben, Max and Piran from custom house quay in Falmouth. This meant an early start, so with family asleep, I made ready for sail, pulled up the pin and motored down the Percuil to St Mawes. The waters of the Carrick Roads were pretty rough, as the southerly F6 was blowing straight in, but with Mr Honda harrumphing, we eased across he worst of it in a quarter of an hour or so. After a smooth pickup, with additional crew aboard, we put the sails up for our adventure up river. The combination of strong winds and dead downwind track soon paid to the main sail, so we proceeded on staysail and motor as far as Turnaware Point, after which we hoisted the reefed main again. This gave us a spirited run gybing down the river, with some fairly exciting turns around the King Harry Ferry when the wind decided to perk up even more. As the river narrowed on its wooded banks, the sails were eventually furled and we motored slowly towards Truro. The river makes many turns, and offers a number of inviting creeks, but only one leads to a harbour. 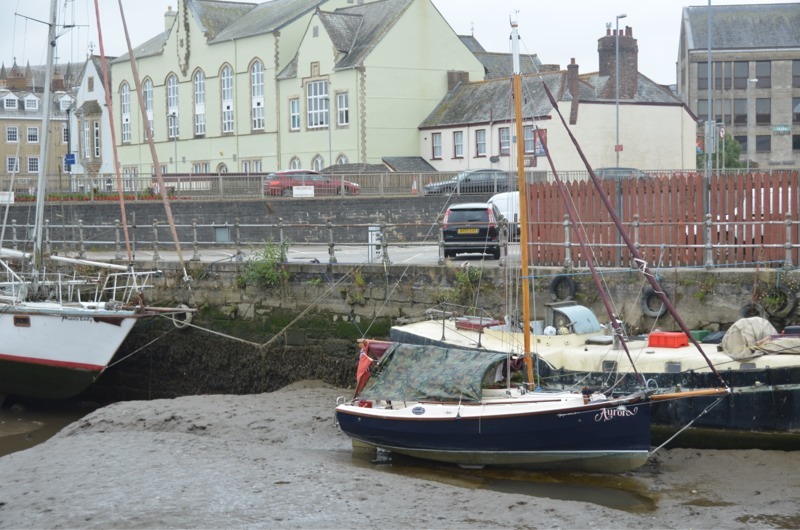 After passing the waiting quay at the flood gate, we trickled though the continental-style bow-to moorings along the shore. The navigable channel finally ends in a fork by a nice old stone quay. We rafted against an old ferroconcrete boat of indeterminate age and type. The fender boards were pressed into action and after some mud measurement with the trusty bean pole, Aurora was allowed to settle onto the embrace of the mud. I was pleased see how level Aurora ended up, helped by a line from mast to shore. After a morning of fairly sunny weather, the awning was pressed into service for lunch, as a series of heavy showers passed overhead. However, after we had eaten and cleared up, the weather had cleared up too. Ben the gave us a walking tour of the town he grew up in, taking in the Cathedral, Victoria Park (where we listened awhile to the excellent St Stythians brass band) and a home made ice cream shop. 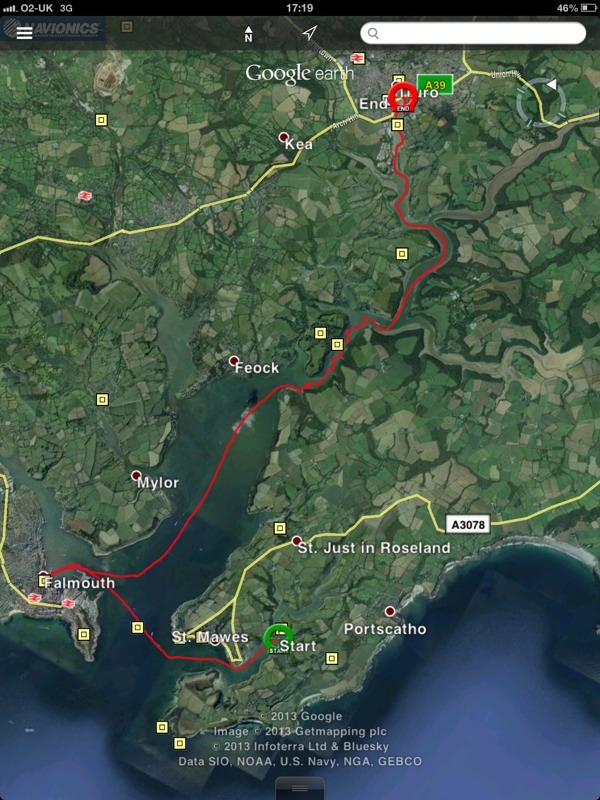 Our guest crew returned to Falmouth by train, to be replaced in the morning for the return trip down river. 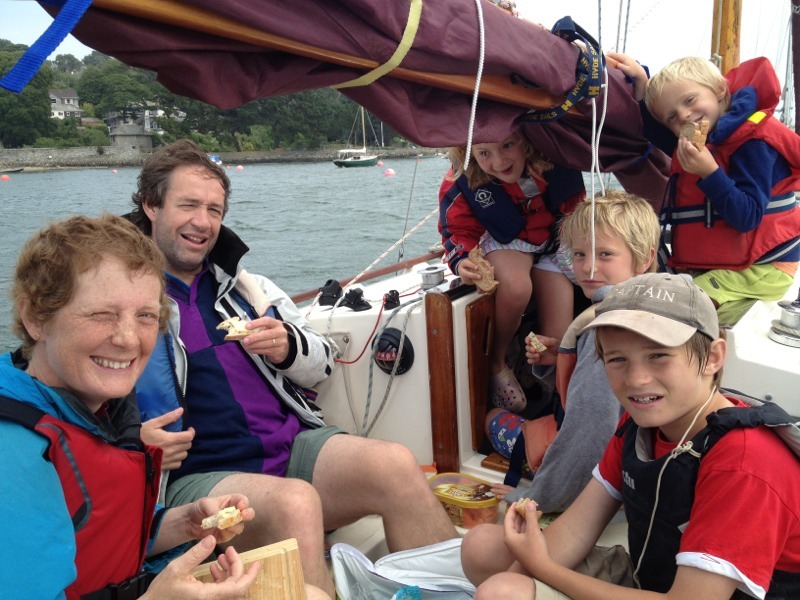 Having reunited the crew on Friday night, we awoke on Saturday morning ready to leave Mylor for a day and a night away. After a lovely breakfast at the cafe, we sailed Aurora to Falmouth and made a textbook drop off of Niki to do some shopping. The kids and I spent a happy couple of hours watching the world go by in the harbour, whilst Niki sorted out provisions. After collecting Niki and the shopping from the quay, we set sail across the Carrick Roads towards Zone Point Lighthouse, looking for an anchorage off the sandy beach. It was a beat to get there but we were rewarded with a nice spot for lunch, after which the kids (and Niki) swam and rowed ashore to play. We were also joined by Zephyr, who rafted up with us and enjoyed the sun for most of the afternoon. 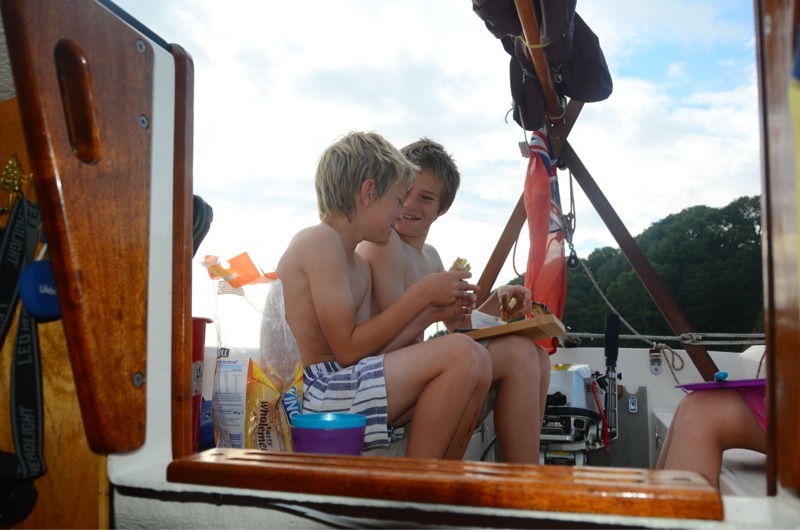 Whist at anchor, we drew up plans for the evening; Russell to sail across the bay to Helford and ourselves to poke our noses up the Percuil river. My initial plan was to take the ground, but I decided to stick to floating depth as, with four aboard, taking the ground might not have given everyone a comfortable night. We had a relatively uneventful cruise up the river near to high tide, and the returned to a convenient pool opposite Priory Point, with several other yachts, for tea. As the sun set, we ate our rice and enjoyed the evening. We were expecting the weather to turn and sure enough, at about 10pm the first spots of rain fell. Luckily, I had asked Niki to buy a tarp from Trago Mills, the local hardware shop. This 2.4 x 3.0m sheet as quickly rigged across the boom and provided a welcome shelter from the weather. I wonder how much we will need it in the next few days? After a frustrating morning trying to book a train ticket, we (myself, Sally, ZMP and Alice) eventually left Falmouth at 1230 and sailed in convoy with Zephyr who was anchored outside the marina waiting for us. The strong winds of the previous two days were abating and after a lively start in F4, we eventually arrived at the mouth of the Helford in a variable F2. 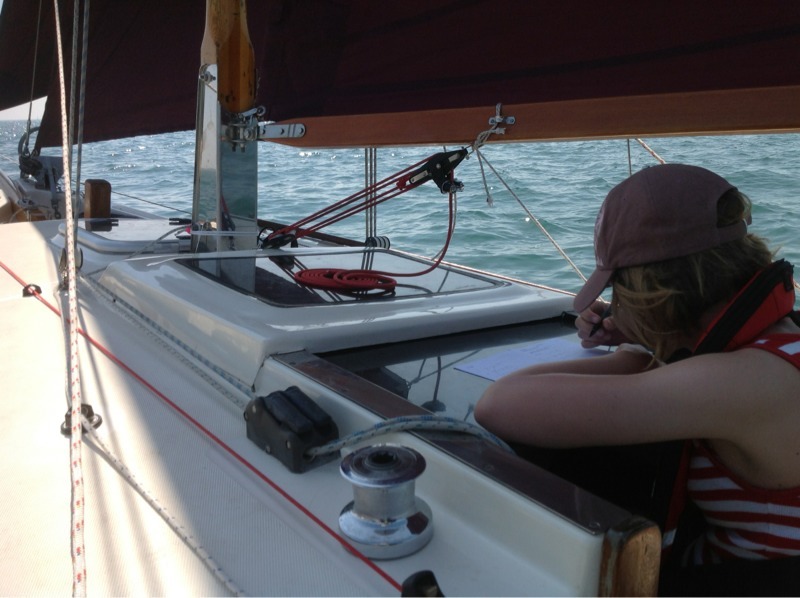 We had made some poor tacking decisions during our beat and Zephyr got there some time before us. 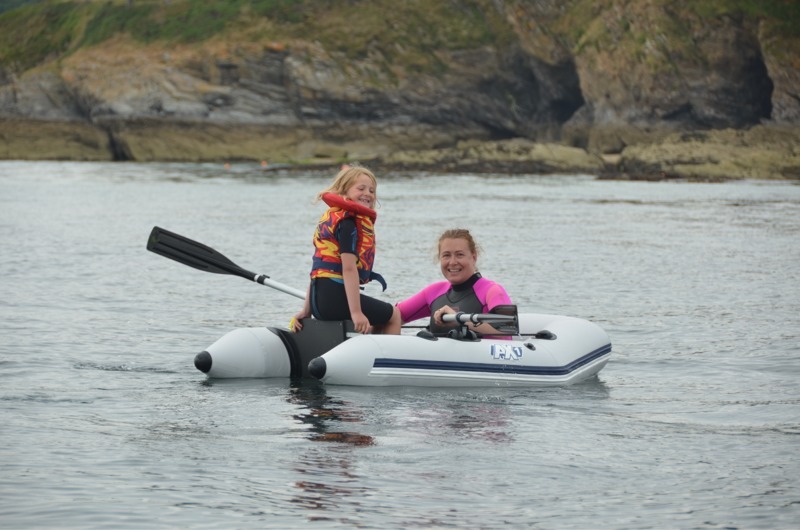 We continued up to Durgan where the tender got its first outing, transferring us to shore for swimming, treasure hunting and a barbecue. As the evening drew on, I took Alice, Zack and Max to the opposite (windward) shore of the estuary and anchored in Ponsence Cove with 3 other boats for the night. The following morning, we returned to Durgan to pick up Sally, Piran and the lunch and then motored slowly up the river. Our objective was to reach Tremayne Quay; this is a stone quay which was built for Queen Victoria (though she never visited). We had no hope of mooring to it at that state of tide, but did well to get that high up river. The depth sounder was distinctly flaky in these shallow waters, but as Zack snaked along finding the channel, I used my crafty bean pole to check the depth. 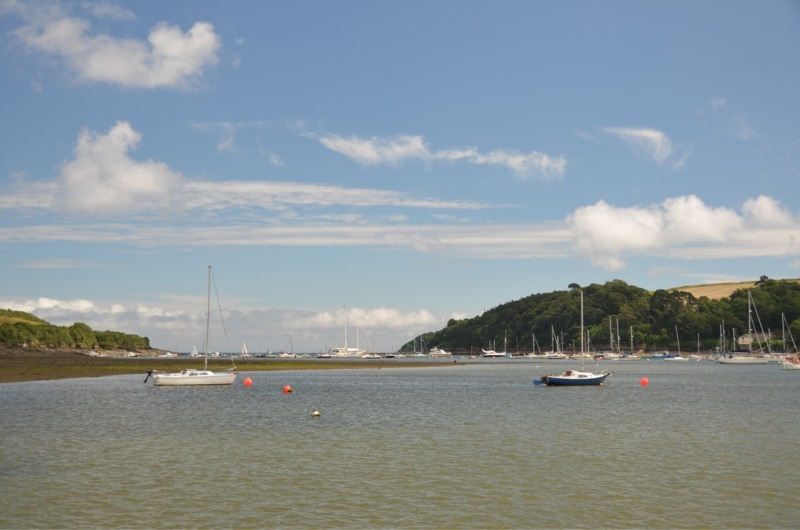 We arrived at Tremanyne to find a large yacht moored in the middle of the deeper pool in front of the quay, with the skipper enjoying the marvellous views of the wooded banks, bird life and sun. 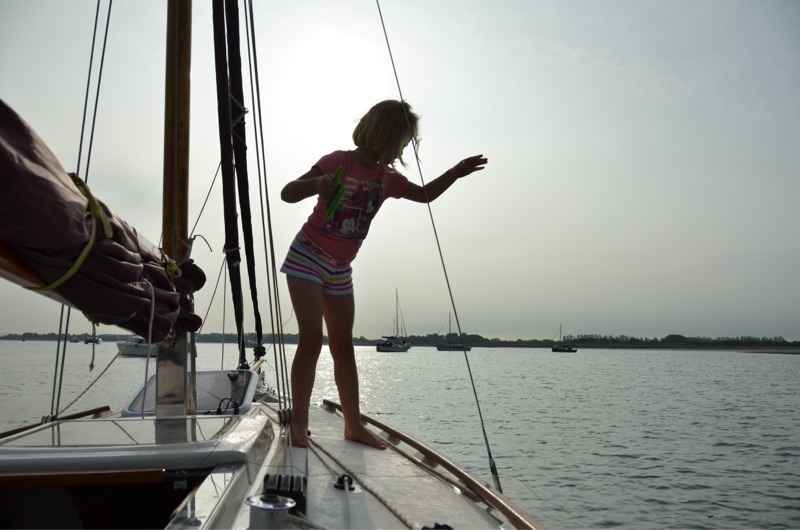 To Zack’s relief, we turned around and then were able to sail downstream on staysail only. Sally decided that she would swim alongside the boat, so we trailed a float. Some of the time she was ahead of Aurora and at other times, we overtook her in a gust and she could grab the float for a tow. Eventually we picked up a mooring off Pedn Billy (not a typo!) in barely enough water to float Aurora (in fact Zack gamely jumped to catch the mooring), as the last of the tide ebbed away. The entire crew had swims (or wade) of varying length (Piran=30 secs, Sally and Max=30 mins). After a lovely lunch in the sun, the tide had returned enough for us to motor away (this fact was signalled by the reappearance of the fender which Max had wedged under the boat as we settled; this seemed to serve to keep the boat fairly level as we took the ground, though its not conclusive because we did not dry out fully). 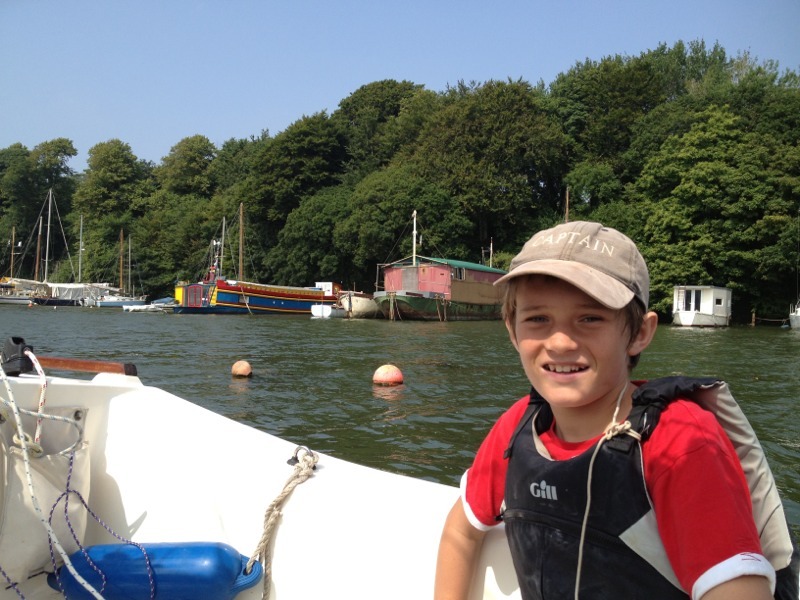 We retuned to Durgan for the final time, so that we could drop off all except Zack (who again did a lot of ferrying in the tender) and collect Ben. 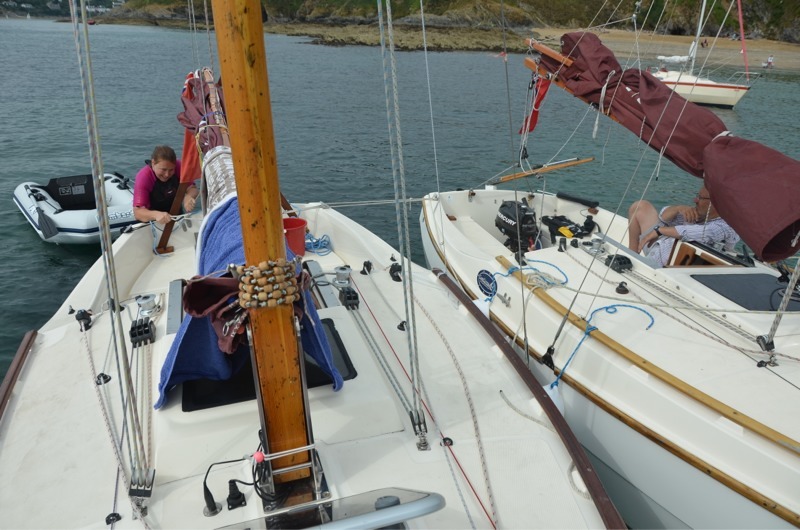 Having deflated and stowed the dinghy below, we sailed out of the Helford for Falmouth. We wondered if we could anchor in Swanpool beach but the wind was almost due S so we decided to scratch this and head for Falmouth harbour. It was an exciting downwind sail and we stood across the bay and continued until we were abeam St Antony’s Head before gybing and continuing to St Mawes and up the Percuil comparing all the boats moored in the river. 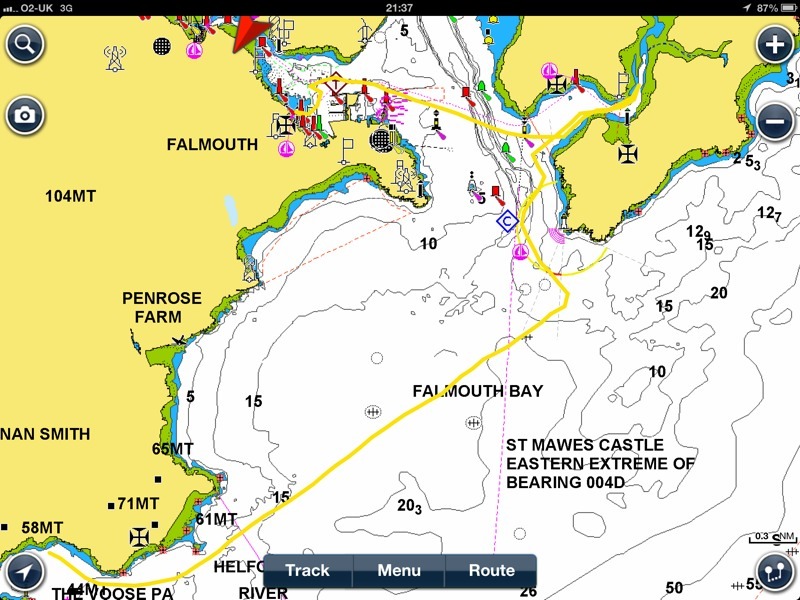 After a brief motor back upwind out of St Mawes, we were able to reach across the Roads into Falmouth harbour to collect Sally and the younger kids. She had not been idle in the meantime and had made some pasties to order using Freda’s pastry and the professional crimping skills of Ben’s pasty-making brother, Jonathan. Tea was had mooching about the harbour at the top of a spring high. 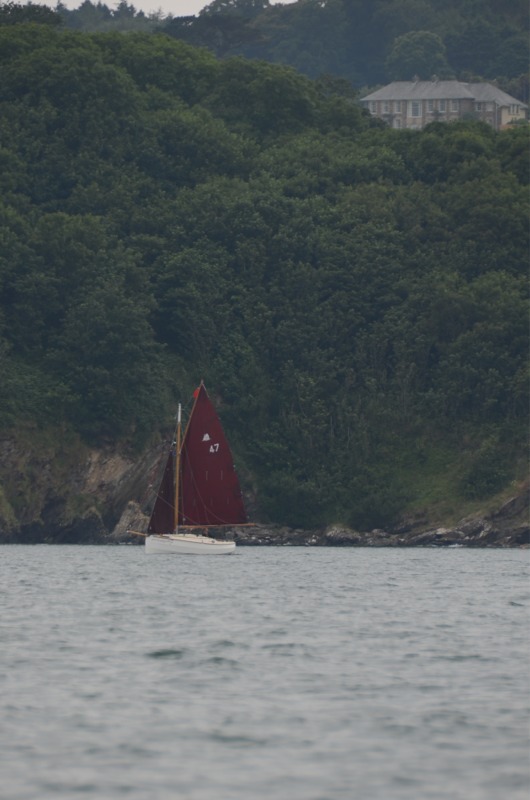 At one point we sailed alongside Zephyr, who had been visiting Falmouth for the day and was returning to Mylor. Having dropped off the Amos clan at custom house quay, Alice and I motored back up to Flushing and dropped the pin for the night. My tidal calculations proved correct, as at low tide we just kissed the bottom (I raise the clonking plate at night anyway). 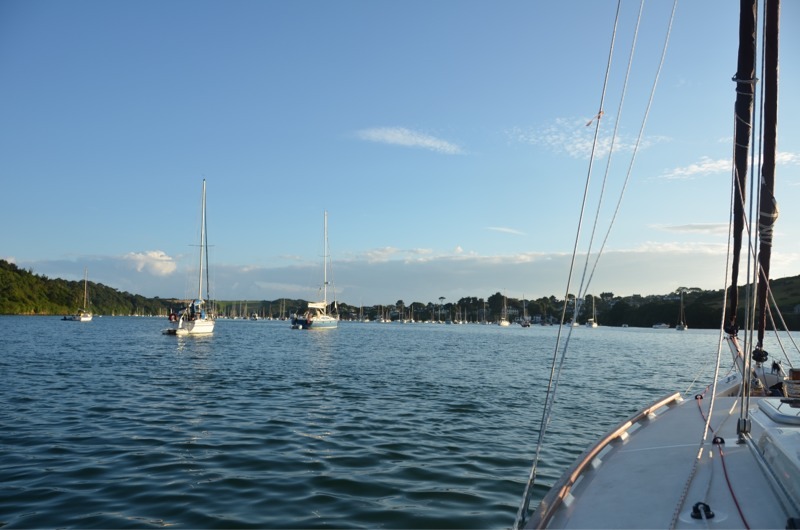 After an early reveille, I sailed Aurora back to Mylor. It was a glorious morning and the gentle Southerly gave us a rapid three-sail run to the marina, which was over all too soon. 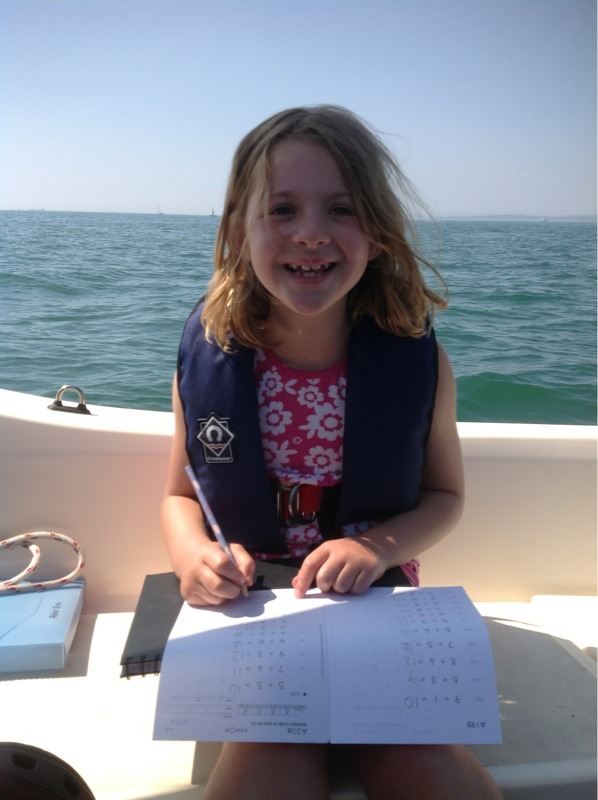 Aurora was thus left to rest for a day or two (though she was rafted for company) whilst shore based activities took place and the whole family would be reunited later in the week. Logged distance so far this trip: 47.7nm. 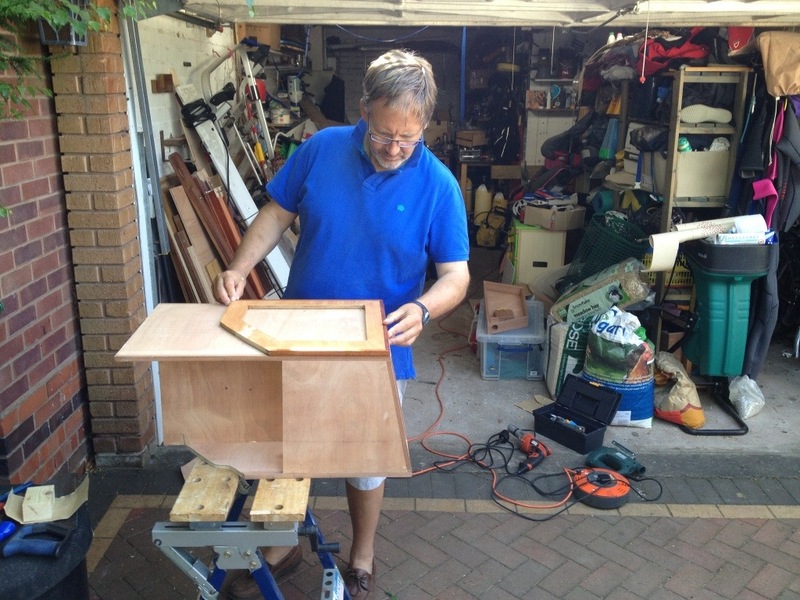 We trailed Aurora to Falmouth for a holiday with our friends Ben and Sally, who live here. Travelling in convoy on the motorway with Zephyr, we left home at 0415 and arriving at Mylor at 0930 after an excellent journey. It was a stunning day, but very windy, and it soon became clear that there wasn’t much opportunity for sailing, or even motoring today. 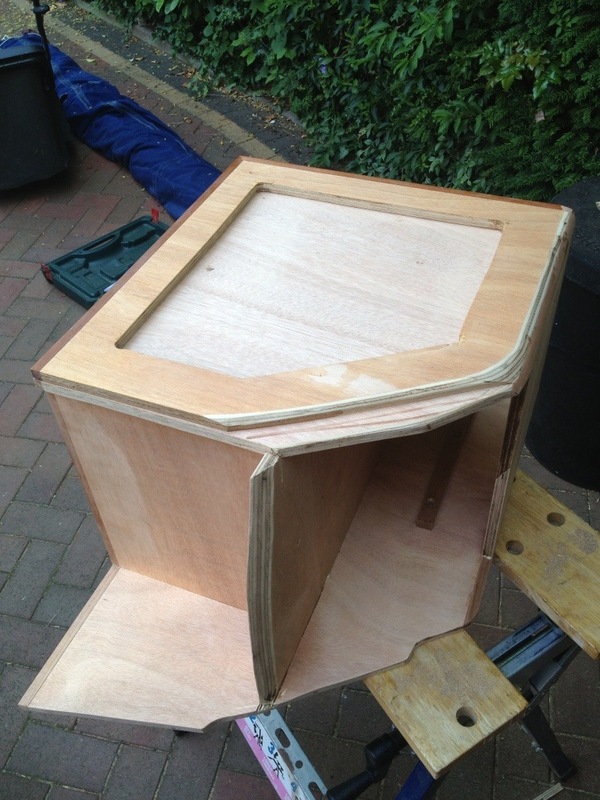 Therefore, the day was spent launching, tucking the trailers away and fettling the boat. 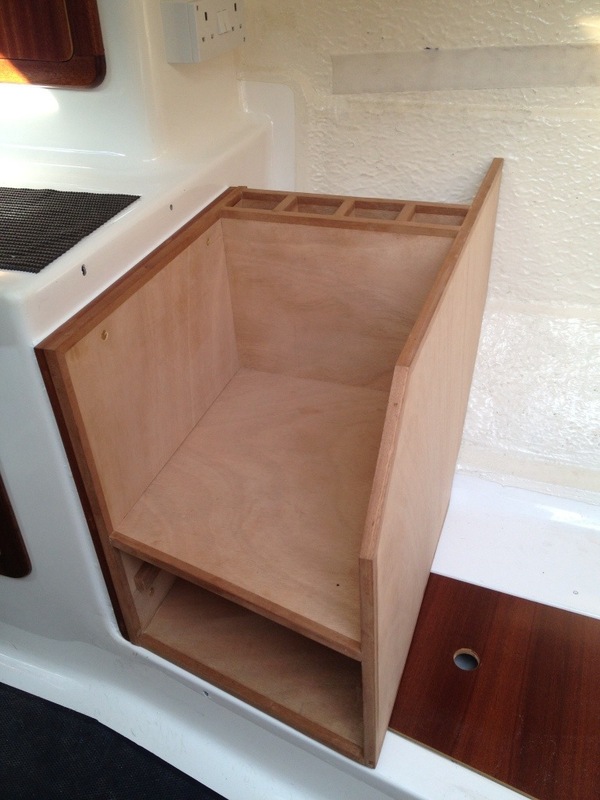 Thanks to fellow Cape Cutter 19 owner, who lives locally, for looking after our trailer. 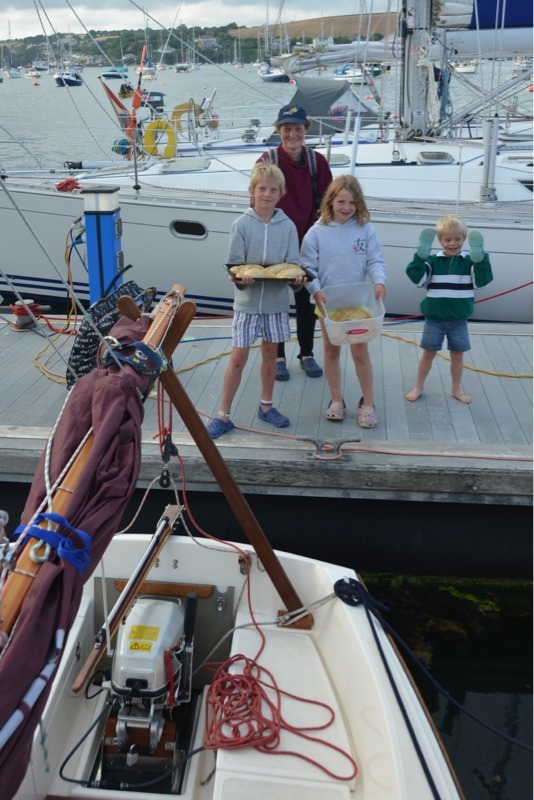 Saturday night was more peaceful, but the wind was still a steady F6-7, too much for day tripping with 3 adults and 4 kids, so I motored from Mylor to Falmouth with Ben and his two elder sons Zack (12) and Max (10), to pick,up Sally and the little ones- our Alice and Piran (5). The water in the Carrick Roads was pretty rough and I decided I did not want to punch into the stiff Easterly with so many aboard, so decided to potter up towards Penryn. We picked up a mooring and had a lovely lunch in the sun and then sailed on staysail only all the way to Penryn and admired the houseboats, before turning round and motoring back to Falmouth. By this time, the wind had subsided a bit and we motored across to St. Mawes, passing the wrong side of Lugo rock, since there was plenty of water. Once we reached this windward shore, it was like a different day with calm water, very little wind and warm sun and we trickled up the Percuil just a little beyond St. Mawes and dropped anchor close to a beach on the opposite side to the town. The children (and Sally) had lots of fun jumping off boat and swimming around (in Sally’s case) and under (in Max’s case) the boat. 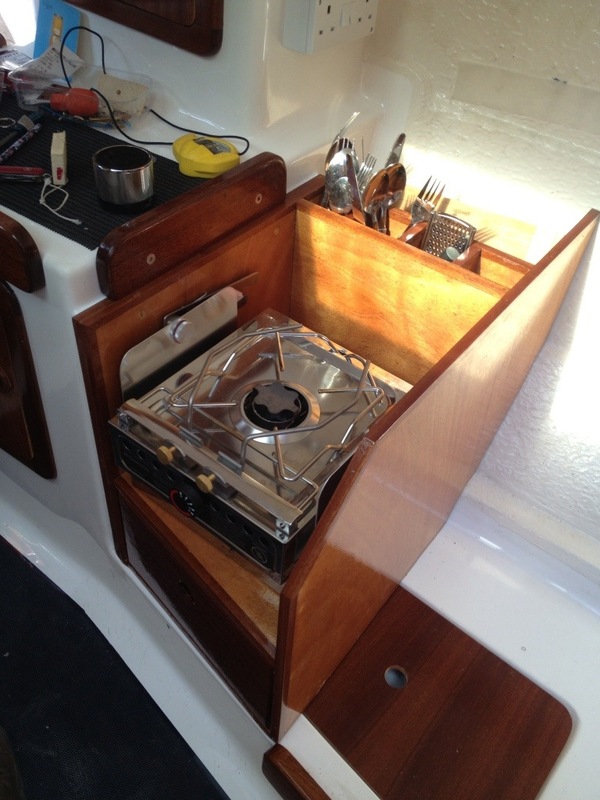 After some snacks and hot drinks, prepared on the new galley, we sailed back to Falmouth. By this time, the wind had dropped considerably in the roads and we had a leisurely downwind sail on main and staysail back into Falmouth, where, after a deft piece of reversing, we managed to tuck unrafted into a spot at the pontoons near Custom Quay. Having laid plans for tomorrow, Alice and I bid good night to Ben, Sally and the boys and then nipped into town for some well earned fish and chips. 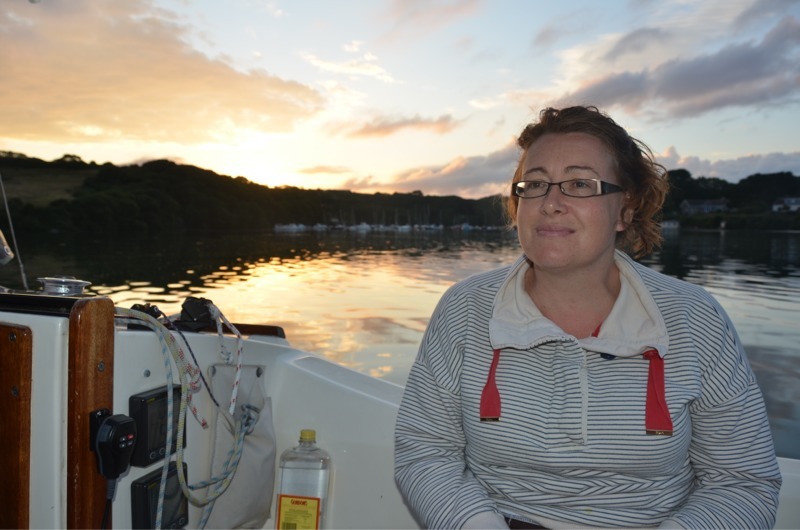 The sun set on a still evening in complete contrast to this morning, so we are hoping for a leisurely sail round to the Helford River tomorrow. We awoke on Sunday to a windless and very warm morning. Thinking we had a plod back to Northney on the engine, I was keen to set out as soon as possible to avoid the worst of the foul tide. 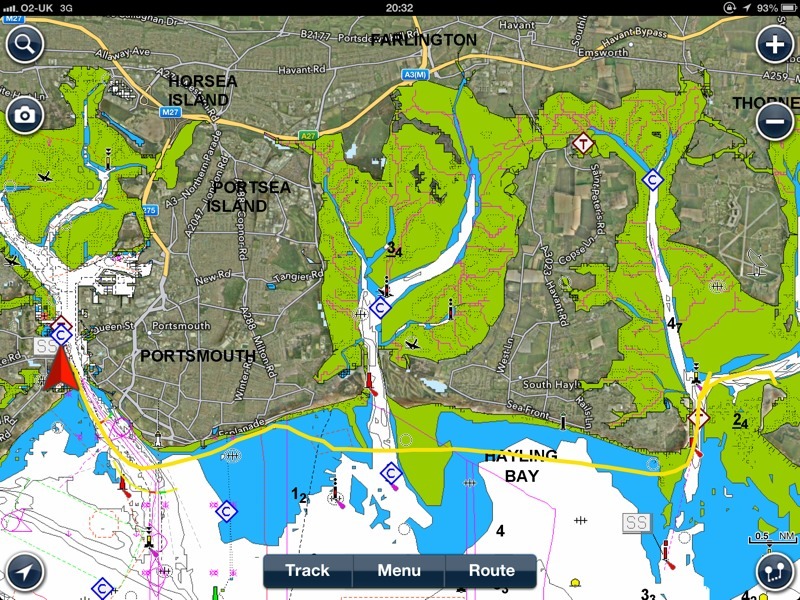 So it was we motored out of Haslar and made our way down the small vessel channel, waiting for the big boys (ie ferries and hovercraft) to go on their way, before “crossing the road” to the Eastern side of the channel and around the point towards Southsea pier. There were distinct puffs of breeze and, by the time we had crossed the channel in the submarine barrier, we were able to give Mr. Honda a rest and sail close hauled with main, staysail and Yankee on a course which took us just outside the East Winner bank at the mouth of Langstone Harbour. During this run, both girls did their maths homework (cruel parents that we are! ), but the wind petered out as we approached Chichester. You may be able to see from our track that Niki is rather better than me at helming in light airs, but even she could not eke more than a knot sog out of the gentle breeze, so we woke Mr. Honda up again in order to pass into Chichester harbour. The scene was rather like the M3 motorway had been on our journey down on Friday night, with strings of boats entering and leaving the harbour. Avoiding most of the motorboat wakes, we joined a convoy inbound. There then followed a race to the seriously crowded anchorage at East Head. 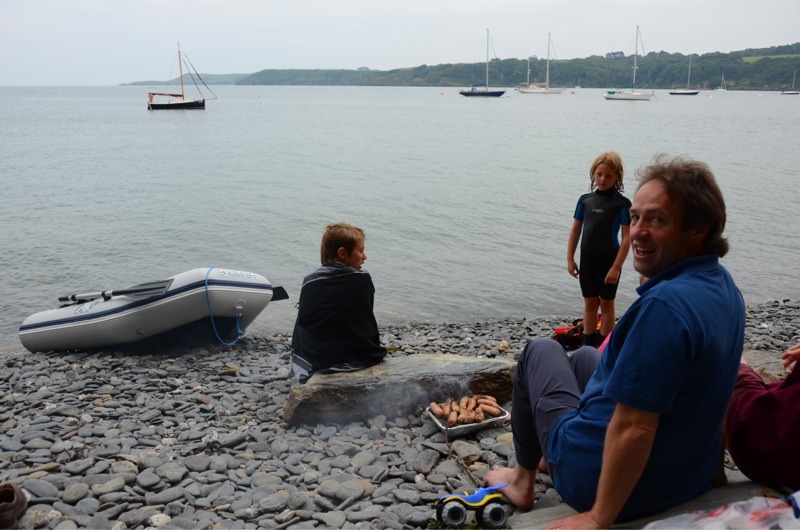 Even with our miniscule draught, there was no space at the anchorage proper, but there was so little wind, it was easy to find a spot further W. we dropped the pin next to a family in a Cornish Shrimper and the girls enjoyed jumping off aurora and swimming ashore. As the tide turned, this became more challenging and, much to their disgust, we recalled the girls from the water. 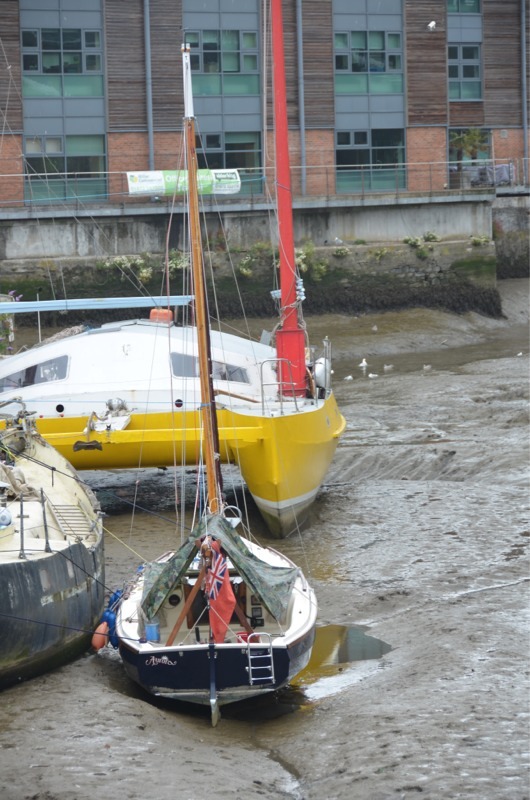 This proved to be the rot choice, as we watched no less than 3 boats discharge occupants into the water, who could then not swim back to their boat again! In one case, a tender was dispatched but then it’s engine could not be started and they had to be helped by the harbour master. A new experience was the ice cream boat. 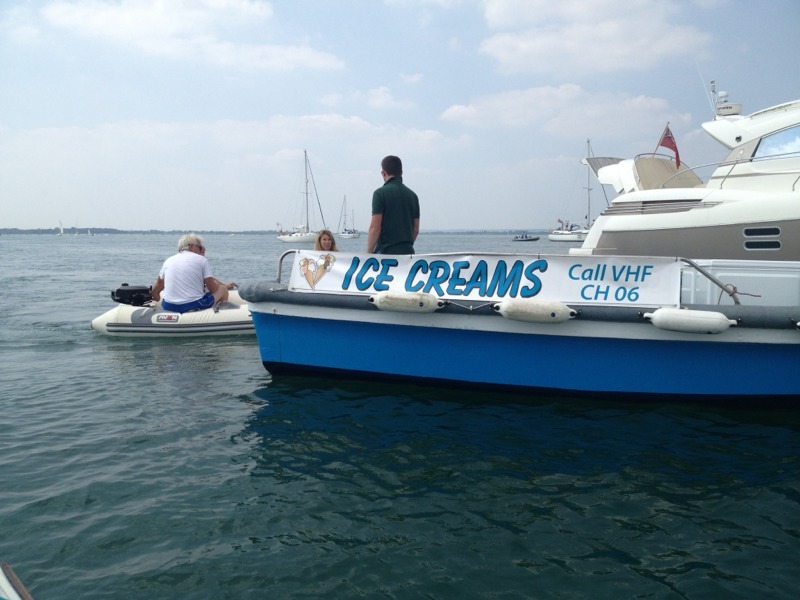 The enterprising Itchenor ferry man had kitted out his boat with freezers and was delivering tasty ice cream tubs. Most welcome! 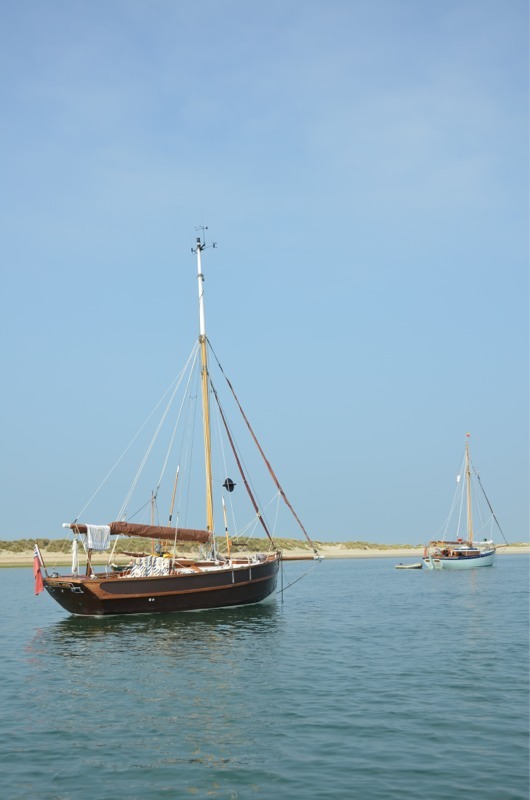 Eventually, we reluctantly pulled the anchor and motored back to Northney. The recovery was not too painful and everyone was polite and good natured, helping each other out (in contrast to the shenanigans last weekend!). We towed Aurora home tired but very happy, a classic weekend. 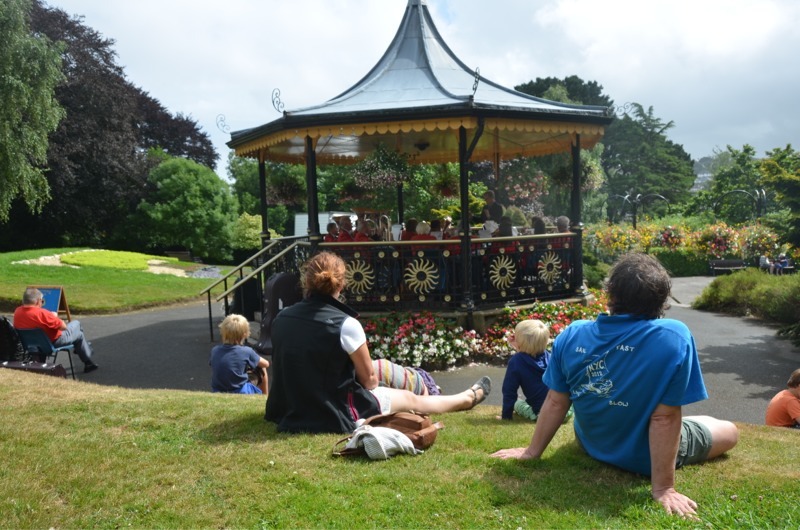 Roll on our Falmouth trip…. Fantastic weather! We have been blessed with two lovely weekends in a row. Today we awoke to a still and slightly misty morning at East Head (with 23 other boats!). 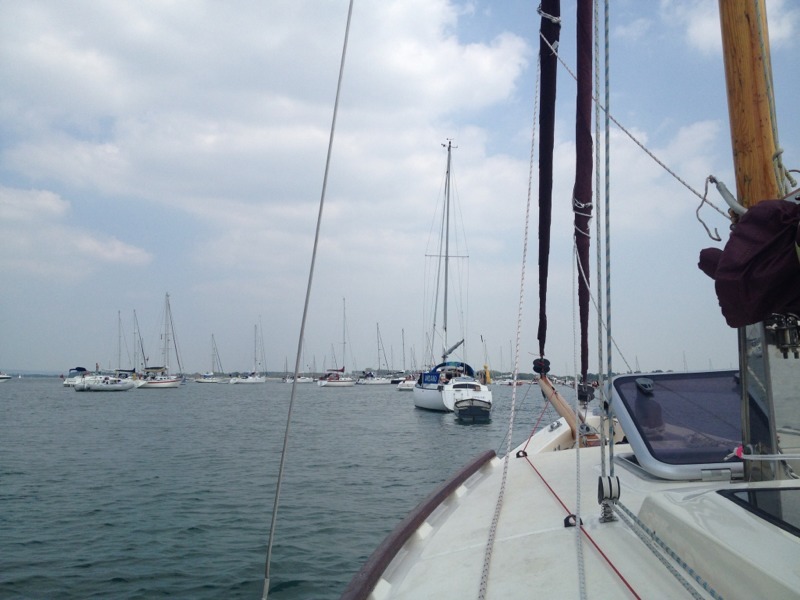 There was little wind, so after breakfast we motored against the incoming tide to the mouth of Chichester harbour. 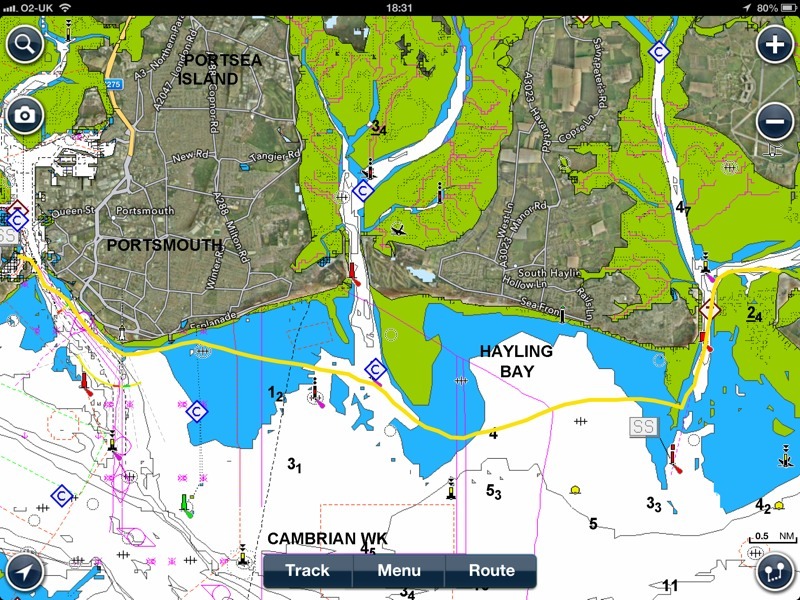 We then followed the shore West with the tide and, although the wind was very light made a steady 3ks. 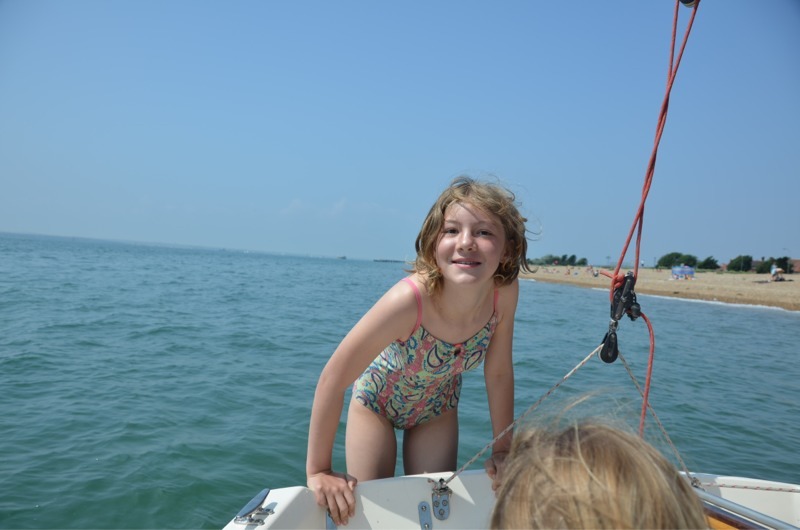 We sneaked across the bank at the mouth of Langstone harbour with just enough water to avoid a detour and turned in to the shore and anchored for a swim. This was rather brief, as the girls shrieked into the water, only to discover quite a strong tidal current parallel to the shore (which explained the lack of swimmers on the beach). With characteristic presence of mind, Niki threw the main sheet to the girls, so we avoided having to up anchor to retrieve them. 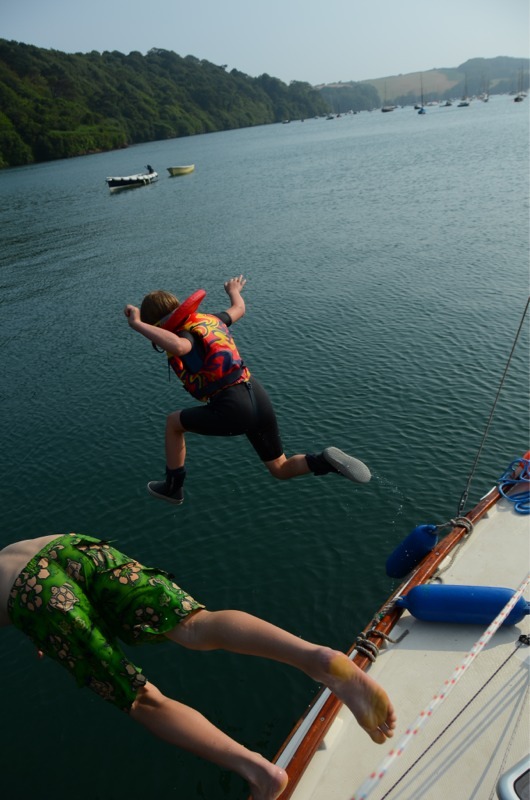 Once aboard again, Aimee took great delight in jumping off, floating past and grabbing the swim ladder. Once the swimmers had dried off, we continued along the Southsea shore, past the pier and into Haslar marina. Aimee had some more practice at radio drill, but got rather short shrift from the marina office. 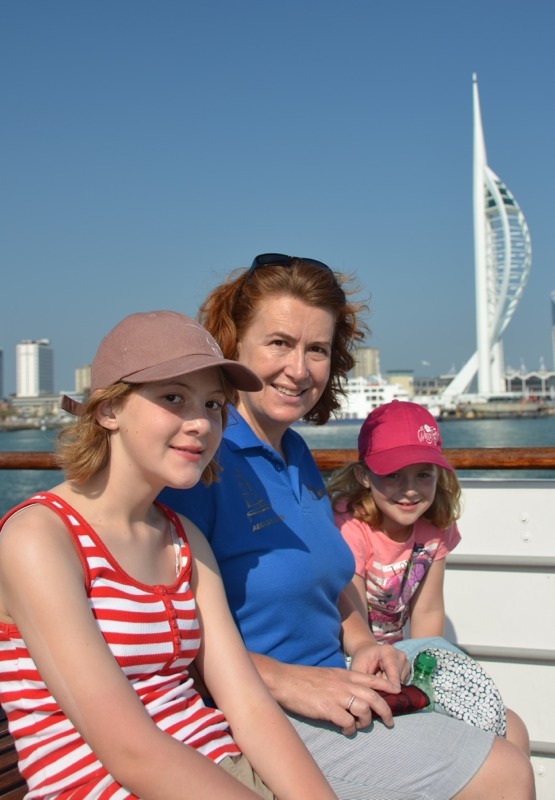 After freshening up and time for Alice to do some fishing in the marina, we then had a pleasant meal in Portsmouth before delivering a rather erratic Alice to the forepeak, with a promise of more fishing and swimming on the morrow. Meanwhile, it was a rare evening to sit out on the cushions in the cockpit and watch the world go by in the marina. 10.9nm, 4hrs 30 (including swim stop!). Avg speed 3kts.